The island of Oahu is the second oldest island in the Hawaiin chain of islands. The two major mountain ranges in Oahu, the Waianae and the Koolau range, contribute to the amazing hiking trails of Oahu. In addition to the mountains, there are amazing scenery and hiking along many beach cliffs. The Aiea hiking loop is a beginner hike that makes a four and a half mile loop beginning at the top of Aiea Heights Drive in the Aiea National Park. Approximate time to complete the hike is two to three hours. The hiking trail is also used by mountain bikers, so use caution. The Aihualama hiking trail starts where the Manoa Falls trail ends. The Aihualama trail is in the rainforest with areas of giant bamboo. The trail can get muddy and slippery due to all the moisture. This trail is just outside of Waikiki on Manoa Road. The scenic Ala Wai fresh water canal makes for one of the easier Oahu hiking trails. Ala Wai canal begins at the western entrance of Waikiki. The canal removes up to 150 inches of rainwater each year from the southeastern coast of Oahu that was a swampland prior to the canal system being built in 1922. The hiking trail along the canal is perfect for strolling or biking, day or night as it is well lit. 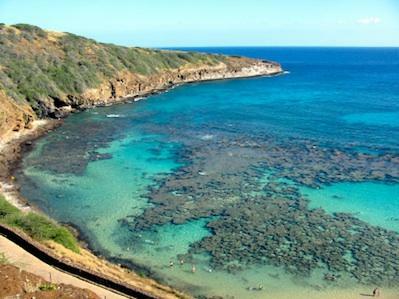 Diamond Head hiking trail is located on the South East coast of Oahu on the most famous volcanic crater in Hawaii. The Diamond Head crater has been extinct for 150,000 years so it is completely safe to hike there. The hiking is spectacular and is rated as easy to moderate. Diamond Head trail is one and three-quarter miles in length and will take approximately one to two hours. The Hauula Loop overlooks the beautiful view of the famous North Shore surfing beach. The trail is considered a beginners trail. You can park your vehicle at the beach and start the short loop along the bluff that may take approximately one hour to complete. The Kaena point trail is located at the top point of the island of Oahu. The trail has beautiful ocean scenery and is considered a beginners trail. The hike, even though it is easy, is long and may take up to three hours to complete. The Laie trail is an intermediate to advanced hike. The trail begins near the Mormon Temple and Brigham Young University Hawaii on the island of Oahu. The Laie hike is a 12-mile round trip hike if you choose to do the entire thing. It takes two hours to get to the waterfall and another two hours to get to the summit of the mountain range. Some Oahu hiking trails are in remote locations. Make sure you hike with a friend and let others know your route and when you expect to complete the hike. Bring along water and snacks for the trail. Some of the hikes will require sturdy hiking boots, while the easier ones are conducive to lighter walking shoes or tennis shoes. Wear sunglasses and sunscreen as protection against the sun. Stay on the trail and do not drink from any streams, as they may be unsafe as drinking water.